A few summers ago, we were on the beach and just in the water where the waves broke, we found a live clam. Needless to say, there was a bit of foraging by all of us, trying to find as many clams as we could. We brought them to the house, soaking them in salted water to let them spit out the sand. These were as fresh as one can ask for, so there was quite a bit of sand (or we may not have soaked them long enough, so anxious we were to cook them up). My kids have always gobbled up mussels, but the latest favorite is the versatile clam. 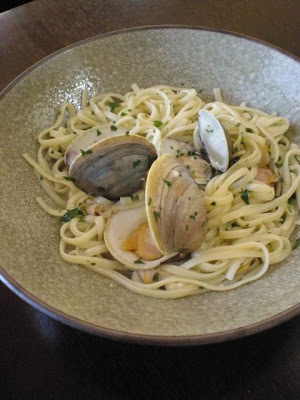 From the classic Linguine alla Vongole (which we were on search for the other night) to the creamy New England Chowder to flavorful Chinese Clams in Black Bean Sauce, these dishes are all greeted with enthusiasm. It's nice to have lots of clams, so I like to add jarred clams merely to supplement the fresh ones. 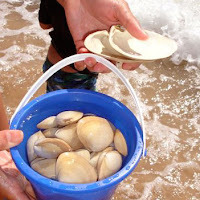 Preparing the clams: Make sure each clam is firmly shut. If any are slightly open, give them a hard knock on the shell with the back of a wooden spoon. Discard any that do not shut again, or that have cracked and broken-off shells. Rinse with water and scrub the surface. Let them sit in lightly salted water for 10 minutes or more, so they can spit out any sand. NOTE: If you’re buying the clams the day before cooking them, don't store them in a plastic bag. Let them rest in a bowl, covered with a damp paper towel. Prepare the clams, as above. 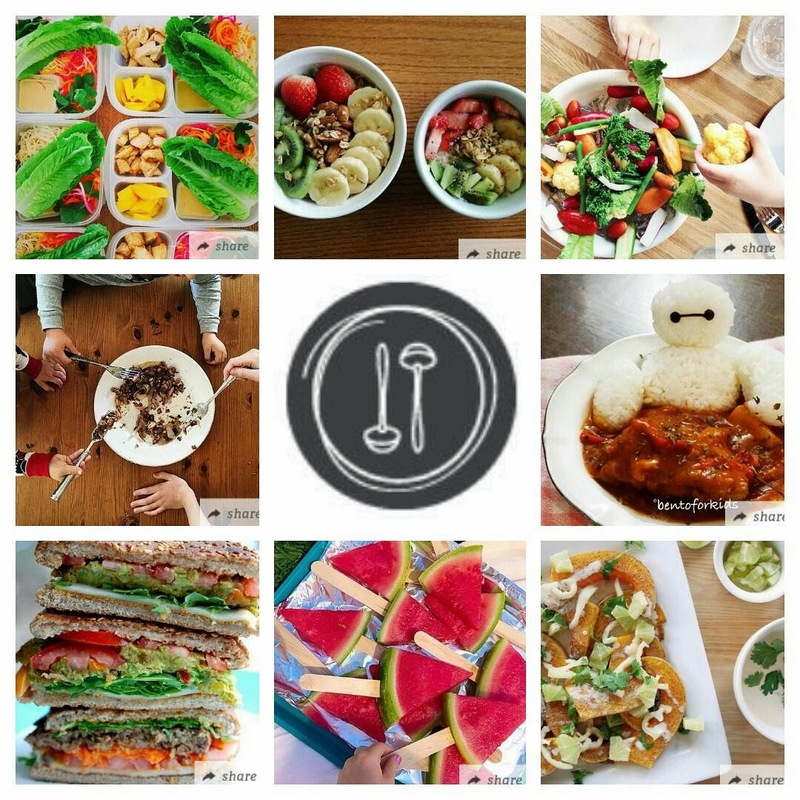 In a small bowl or measuring jug, combine the wine, lemon juice, salt and chili flakes. Set aside. In a large, deep saucepan that will hold all ingredients, add the oil over a medium-high heat. When it’s hot, sauté the garlic for about 1 minute. Pour in the lemony-wine mixture, turn the heat up and bring to a boil. Add the fresh clams and cover and steam for 5-10 minutes, until all the clams have opened wide (you may need to scoop out some of the ones that have opened quickly, cover again and wait a few more minutes for the other to open. Discard any that do not open at all after 10 minutes). After all the clams have been removed from the pan, set aside. You can take them out of the shells and chop them up to toss them into the pasta, but you can also keep them in the shells to serve on top of the pasta. Or chop up half and serve half of the clams in the shell (pictured). Add the butter to the liquid in the pan, melt and stir it in, then add the drained pasta, tossing to coat. Toss with chopped parsley leaves and serve, distributing the clams appropriately. One of my childhood favorites, last summer I thought i would give the recipe a try. It turned out to be a great, non-stodgy summer classic. In a deep frying pan with a lid, bring 1” (2.5cm) water to a boil. Add the clams, cover and steam for 5-10 minutes until they have all opened (discard any have not). Remove from the heat and set aside. 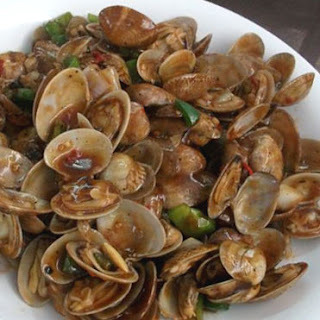 When cool to touch, remove the meat from the shells and chop into small pieces. Reserve the steaming liquid, a.k.a clam "juice". In a stockpot over a medium heat, melt the butter and sauté the onion, leek and celery for 5-10 minutes, until soft. Add the flour, thyme, salt and pepper, stirring to combine. Add the clam juice. Bring to a boil, then turn down the heat and cover. Simmer for 15-20 minutes. If possible, warm the milk and cream up slightly, for 1 minute in the microwave. 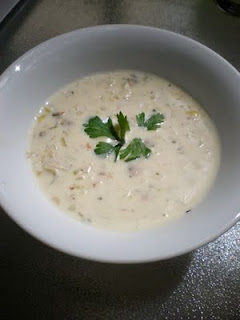 Let the soup cool slightly then gradually add the cream, milk and clams, stirring the whole time to release the steam. Return to the heat and simmer for a further 20-30 minutes. Serve hot with a spoonful of freshly chopped chives, parsley or dill. Clams in Black Bean Sauce!